In order to attend the call of the UN Secretary General, Kofi Annan, for a very comprehensive celebration of the Tenth Anniversary of the International Year of the Family, in 2004, the World Family Organization, along with its affiliated NGO’s and Universities in 189 countries, as well as 127 Governments, took the initiative to call for a World Family Summit – WFS. The main purpose of the various editions of the World Family Summit is to promote Family’s contribution to the implementation of the Millennium Development Goals following a multi-stakeholder approach. It constitutes the biggest partnership towards making the present and the future world with more peace, security, justice, tolerance, solidarity, prosperity and integrated by mobilizing and promoting the basic economical, political, socio-cultural and sustainable unit of the society – the Family. The World Family Summit represents a legacy for the future generation, through the engagement of all sectors of Society in a “Learning – Dialogue – Action” process. The World Family Summit +1 was organized by the World Family Organization with the support of the United Nations – Department of Economic and Social Affairs/NGO-Section/UN-NGO-Informal Regional Network, hosted by the Government of Sergipe State, Brazil, and held in Aracaju City, from December 3 to 8, 2005. The theme of the Summit, Investing in Development: Working the Millennium Development Goals at the Local Level and in the Family provided a very fertile ground for discussions on innovative ways to implement the Millennium Development Goals and adopt a Practical Plan of Action that can be easily executed at the Local Level, priorizing Family focused social public policies, with full participation of the community and the Family. Around the world, the great engagement of citizens, families and communities is becoming a feature of many governments and both public and private organizations. Families are expecting to be involved and to have a say in the business of local governments and in the political decisions that affect their interests. The implementation of the Millennium Development Goals by the Local Authorities focusing public social policies and the actions recommended on the Family are renewing commitments to effective engagements of all sectors of society to deliver better results for families and communities. In many different contexts and at local, state, regional, national and international levels there are public, private, NGOs and other community organizations engaging in ways that are making a difference and that are worth hearing about and learning from. The Summit provided delegates with the opportunity to hear and share examples of contemporary practices, theories and policies from around the world, connected to the benefits of the implementations of the Millennium Development Goals at the Local Level. The program was designed to open dialogue and encourage the development and maintenance of productive relationships between all stakeholders. The main purpose of the World Family Summit +2 was to continue the work initiated in Sanya, China in 2004, and to continue and evaluate the results from the WFS +1 held in Aracaju, Brazil, including the impact of the Plan of Action. • To place family issues in definitive in the International Agenda. • To increase awareness of family issues among National Governments, Local Authorities, NGOs and CSOs, Parliamentarians, Academia, Private Sector and Families. • To strengthen the capacity of National and Local Institutions to identify, discuss, formulate, implement and monitor family-related policies. • To enhance the effectiveness of local, national and regional efforts to carry out specifics family related programmes, generate new activities and strengthen existing ones. • To stimulate public-private partnerships to respond to problems resulting of globalization, affecting and affected by, the situation of families. • To improve collaboration among all actors of the Society, local, national and international organizations in support of families. • To determine the appropriate means to implement concrete actions. The World Family Organization is proud to partner with the Polish Government, the Foundation “Communication Without Barriers” and the United Nations, through the Department of Economic and Social Affairs/NGO-Section/UN-NGO-Informal Regional Network and the UNAIDS – Joint United Nations Programme on HIV/AIDS to bring together the World Family Summit +3 on the theme Working Out of Poverty: Mobilizing for Action by building trust, bridges, capability and partnership. Since our first gathering in 2004, in China, we have been diligently fulfilling the commitments registered at the Sanya Declaration, the Sergipe Practical Plan of Action 2006-2015 and the Dead Sea Declaration approved at the World Family Summits held in 2004, 2005 and 2006. Its time for the World Family Summit +3! The theme once again present us many challenges to discuss, make conclusions and recommendations. We are already at the deadline mid-term to the achievement of the Millennium Development Goals and although some progress have been made, this progress is not equally distributed among communities, countries and regions. We strongly believe that our mission to bring the actions to achieve the Millennium Development Goals to the Local Level and to the Family continues to be a cornerstone to sustainable development. The World Family Summit +3 will continue to provide an unparalleled opportunity for international, national, regional and local authorities, communities and families to be exposed and interact with some of the world’s innovators in the Family Perspectives field, and bring about the opportunity of your contribution to be heard and shared. The World Family Organization and its partners are honored to invite you to participate, contribute and experience this unique initiative, in Warsaw City, the Capital of Poland, from November 26 to 29, 2007. 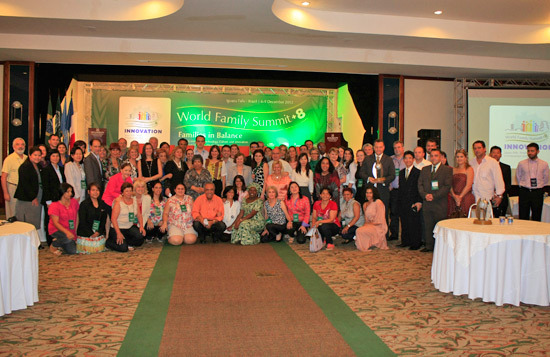 The World Family Organization had the honor to host the World Family Summit +4! Encompassing the main theme of the 2009 High Level Segment of ECOSOC and its Annual Ministerial Review and the Development Cooperation Forum, and in the spirit of the World Family Summit +3, held in Poland, the main theme of the World Family Summit +4 is: Lives in the Balance – A Global Mobilization to the Achievement of the MDGs 4 and 5: Ensuring the Rights to survival, to protection and to development. The discussions approached different aspects involving maternal and child health care based on a family and community health systems, the legal aspects of social protection needed to ensure the survival and the economical aspects to guarantee the sustainable development of families and communities. The Warsaw Declaration is a powerful document which reflects the willingness of the World Family Summits participants along these last five years to mobilize a Global Partnership to ensure that Governments, NGOs, Academia, Parliamentarians, Media, Business Community, Civil Society and Families will respond to the different commitments made with concrete actions. The task was complex and difficult, but not impossible. At the World Family Summit +4 we looked for a very strong response towards the commitments done on the World Family Summit +3 and in the Warsaw Declaration, involving First Ladies, Former First Ladies at National and Local Level, international personalities, multilateral and bilateral partners in favor of maternal, newborn and child care under a broad concept including health care, social protection and economic development. The World Family Summit +4 was held in Cairo, Egypt, on December 1 to 4, 2008, and organized in partnership with the United Nations ECOSOC Office for Support and Coordination, United Nations NGO Section, Ministry of Social Solidarity of Egypt, National Council for Childhood & Motherhood of Egypt, League of Arab States and the Egyptian Business Women Association. The World Family Summit +5, encompassing with the decision of the UN ECOSOC to work for the year 2010, the current global and national trends and challenges and their impact on gender equality and empowerment of women which refer us to the MDG 3, will discuss how countries, governments, politicians, judicial systems and civil society are approaching the issue. A good picture of the past and a perspective for the future will be our great challenge to come up with a declaration that will reflect the reality of the twenty first century regarding Gender Equality and Women’s Empowerment. The efforts done by many women’s organizations and networks in the past two decades resulted in a global, national and local recognition of the contribution that women make to economic, social and societal development. We all agree that reducing gender inequality and empowering the woman are very powerful tools to reduce poverty and achieve high levels of well-beings of families in all cultures and societies around the world. Gender inequality is deeply rooted in entrenched attitudes, societal institutions and market forces, therefore, political commitments at the highest international and national levels, and especially, actions at the local level are essential. Political commitments can allow the adequate establishment of policies that can target social changes and to allocate the necessary resources to achieve Gender Equality and Women’s Empowerment. Gender is social construct. It defines and differentiates the roles, rights, responsibilities and obligations of women and men. And those differences form the basis of social norms that defines behaviors for women and men and determine their social, economic and political power. The World Family Summit +5 will have as its main guidelines the work done by the Millennium Project Task Force on Gender Equality – MDG 3 – focusing on the analysis, discussions, conclusions and recommendations about the goals and targets decided in the year 2000, the reality of the year 2009/2010, and especially, reflecting about the new “MDG 3 + approach”. One very important topic for the World Family Organization and the participants of our Summits is to highlight the importance of Gender Equality and Empowerment of the women relating to the Family in all cultures. Since the year 2004, when the first World Family Summit was accomplished, in Sanya – China, this annual event continues to be the biggest partnership towards making the present and the future world with more peace, security, justice, tolerance, solidarity, prosperity and integrated by mobilizing and promoting the basic cell of society – The Family – and a legacy to the future generation, through the engagement of all sectors of Society in a “Learning – Dialogue – Action” process. The World Family Summit +6 was hosted by the World Family Organization, in partnership with the UN DESA ECOSOC Office for Support and Coordination, the UN DESA NGO Branch, the UN NGO Inter-Regional Network (NGO-IRENE), the UNESCO Education for All Movement and the International Association of Economic and Social Councils and Similar Institutions in Paris, France from 3 to 5 December 2010. Encompassing with the UN/ECOSOC decision 2008/258, the theme for 2011 “Implementing the internationally agreed goals and commitments in regard to education”, the theme for the World Family Summit +6 was: FAMILIES IN BALANCE: Embracing the Education for All Goals – A Global Mobilization towards the Achievement of the MDG2. The Summit was extremely successful, and attracted around 200 participants from all levels of government, academia and civil society. 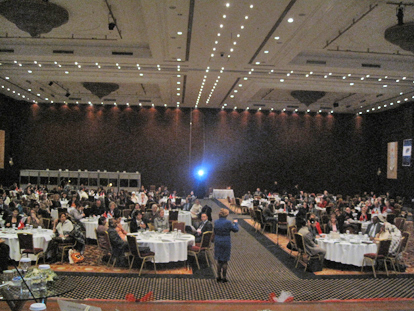 The World Family Summit +7 was hosted by the World Family Organization, in partnership with the General Women’s Union of UAE, UN DESA ECOSOC Office for Support and Coordination, the UN DESA NGO Branch and the UN NGO Inter-Regional Network (NGO-IRENE) in Abu Dhabi, United Arab Emirates from 5 to 7 December 2011. Encompassing with the theme of the 2012 UN ECOSOC Annual Ministerial Review, “Promoting productive capacity, employment and decent work to eradicate poverty in the context of inclusive, sustainable and equitable economic growth at all levels for achieving the Millennium Development Goals”, the theme for our World Family Summit +7 is: Families in Balance: Working our way towards Sustainable Development – Making Decent Work and Social Protection a Global Reality for All Family Members. The global economic and financial crisis has had wide-ranging impacts on families all over the world, and has resulted in a significant increase in the number of families vulnerable to poverty. In particular, increasing food prices and high levels of unemployment have placed renewed pressure on the ability of governments and NGOs to meet the targets set out in MDG1. The World Family Summit +7 committed to introduce a Family perspective to the achievement of MDG 1, which includes the implementation of the Decent Work Agenda, the Global Jobs Pact and Universal Social Protection, discussed these initiatives and presented ideas and new commitments which were registered in the World Family Summit +7 Abu Dhabi Declaration on MDG 1. Encompassing with the theme of the 2013 UN ECOSOC Annual Ministerial Review, “Science, technology and innovation, and the potential of culture, for promoting sustainable development and achieving the Millennium Development Goals”, the theme for our World Family Summit +8 was: “Families in Balance: Placing Science and Technology, Culture and Innovation in the heart of Sustainable Development at Local Level and in the Family”. Focusing on science, technology and innovation was also a follow up to the Rio +20 outcome, which had a significant focus on green technologies. In 2013, ECOSOC organized its work for the Annual Ministerial Review (AMR) around the theme, “Science, technology and innovation, and the potential of culture, for promoting sustainable development and achieving the Millennium Development Goals”. Given the significant potential of the 2013 AMR theme in promoting the global development agenda, ECOSOC could effectively use its role as a coordination body by placing science and technology and innovation-related issues high on national and international priorities. The voice of the families, governmental institutions, non-governmental organizations working on family issues, discussing, contributing and implementing the Pos-2015 Development Agenda! Following the many meetings and consultations being held by the UN, Governments at all levels, NGO’s, Private Sector and the Civil Society, the WFS + 9 will also help respond to the global challenges of the 21st century, building on the Millennium Development Goals and on the emerging views for a new development agenda. At the UN Conference Rio + 20 in 2012, world leaders agreed that after 2015 and building on the Millennium Development Goals, a new set of goals and targets needed to be grounded to finish the job that the MDG’s successfully started. A New Post-2015 Development Agenda is being discussed by all stakeholders involved in the sustainable development process. Governmental Institutions and Non Governmental Organizations working in Families issues as well as Families it selves cannot be out of the discussions and of the agenda setting. The World Family Summit + 9 presented and discussed the ideas and proposals already formulated by different stakeholders, and in special added the voices of the families to the UN consultation process, which already came with some preliminary conclusions. 5. Forge a new global partnership. The World Family Summit +10 coincided with the deadline for the achievement of the Millennium Development Goals and the global wide discussion about setting a new Post-2015 Development Agenda. At the UN Conference Rio+20 in 2012, World Leaders agreed that after 2015, and building on the Millennium Development Goals, a new set of goals and targets needed to be grounded to finish the job that the MDGs successfully started. Since then a new Post 2015 Development Agenda was being discussed by all stakeholders involved in the sustainable development process. The World Family Organization with its members and partners and in special in the spirit of the World Family Summit, could not be out of the discussions and out of the agenda set. That’s why the World Family Summit +9 started the discussion on the ideas and the proposals already formulated by different stakeholders following the indications of all the different groups involved in the process of setting a new Post-2015 Development Agenda. The World Family Summit +10 was a celebrating and a welcoming event. After ten editions of successful World Family Summits we have to celebrate the decade 2004-2014 where Family Issues were definitely included in the Development Agenda. Click here to have access to the Summits Declarations all accepted by UN and translated into its six official languages. We also celebrated the 20th Anniversary of the UN International Year of Families and the achievements of the Millennium Development Goals. Recognizing the discussions done on all previous Summits have to be consolidated, the World Family Summit +10 is welcoming the in course building of the new Post-2015 Development Agenda. We will recall participants on the achievements of the MDGs and also discussed on proposals to be included on the Sustainable Development Goals which strengthened Families further in the process of development. We could not choose a better place for these celebrations than China, where everything started in 2004. In the beautiful city of Zhuhai we inauguratde another decade and a new era for Families by including their voices on the Post-2015 Development Agenda and setting Families’ aspirations in the Sustainable Development Goals. The World Family Organization recognizes that the Millennium Development Goals helped to galvanize development efforts, improved the existence of many families, saved the lives of those threatened by extreme poverty, disease and hunger, reduced child and maternal mortality, improved the health of people with HIV/AIDs and other non-communicable diseases, decreased the number of children out of school, improved gender equality and participation of women, increased access to clean drinking water and sanitation, raised awareness on environmental issues and improved global partnerships for development. Despite those achievements, we also recognized that many challenges still remain, progress in human development continue to be uneven, leaving many behind, therefore it was an urgent need to find new development pathways for transformative changes towards global, inclusive, people-centered and planet sensitive sustainable development to insure human dignity, equality, environmental stewardship, healthy economies, freedom for want and fear and a renewal global partnership. The United Nations Conference on Sustainable Development Rio +20 in 2012, initiated a consultative process with a wide range of stakeholders reaching a consensus that the Post-2015 Global Development Agenda has to be built on the successes of the Millennium Development Goals, the four core dimensions of development which are inclusive social development, inclusive economic development, environmental sustainability, and peace and security as the three core principles which are human rights, equality and sustainability. As the results of these wide consultations, the outcome document on Sustainable Development of Rio +20 ‘The future we want’ proposed 17 Sustainable Development Goals (SDGs) and 169 targets which are directly or indirectly related to the Family. The World Family Organization with its members and partners could not be out of the discussions and out of the agenda set. Acknowledging that the family – the basic unit of society – is a powerful agent for sustainable social, economic, environment and cultural development, including peace and security, bearing the primary responsibility for the care, development and protection of children and elderly, as well as instilling values of citizenship and belonging in the society, the World Family Summit +10 decided to support the SDGs proposals and included them in the next WFO Strategic Framework 2016-2020 to increase cooperation at all levels on family issues and for undertaking concerted actions to strengthen family-centered policies and programs as part of an integrated comprehensive approach to development. The World Family Organization with its members and partners, managing the transition from the MDGs to the SDGs, are strongly committed to work efficiently to help families to understand and exercise the proposed goals in their everyday life, contributing to the achievement of the Sustainable Development Goals by 2030. The World Family Summit 2015 – A New Era for Families – Transforming Our World – Framing the Sustainable Development Goals at the Smallest Unit of Social Capital – The Family, is a beginning of a new era which can transform how the future unfolds for the Family all over the world. Start a new era, framing the approach to development into the Global Post-2015 Development Agenda based on the principles of Sustainable Development, which calls for an integrated policy approach to ensure inclusive economic development, inclusive social development, environmental sustainability, peace and security that responds to the aspirations of all families for a world free of want and fear. 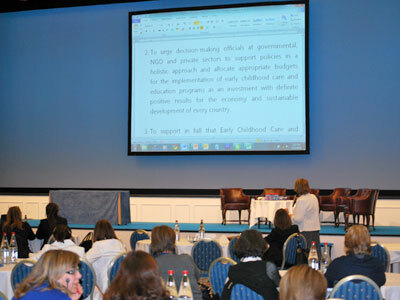 Draft and approve recommendations to the World Family Summit 2015 Declaration. Click here to download the keynotes and presentations exposed during the WFS 2015 Plenary Sessions. Acknowledging that the family – the basic unit of society – is a powerful agent for sustainable social, economic, environment and cultural development, including peace and security, bearing the primary responsibility for the care, development and protection of children, as well as instilling values of citizenship and belonging in the society, the World Family Summit +10 decided to support the SDGs proposals and included them in the next WFO Strategic Framework 2016-2020 to increase cooperation at all levels on family issues and for undertaking concerted actions to strengthen family-centered policies and programs as part of an integrated comprehensive approach to development. The World Family Organization with its members and partners, managing the transition from the MDGs to the SDGs, are strongly committed to work efficiently to help families to understand and exercise the proposed goals in their everyday life contributing to the achievement of the Sustainable Development Goals by 2030. The 2016 World Family Summit – “Families in Balance: Eradicating poverty and promoting prosperity ensuring that no Family is left behind”, was a beginning of a NEW ERA which can transform how the future unfolds for the Families all over the world. Start a new era, framing the approach to development into the 2030 Sustainable Development Agenda, the Sustainable Development Goals and Targets, which calls for an integrated policy-action approach to ensure inclusive economic development, inclusive social development, environmental sustainability, peace and security that responds to the aspirations of all families for a world free of want and fear. Provide participants with expert analysis on means to include and implement family-focused policies and services contributing to eradicate poverty and promote prosperity, ensuring that no Family is left behind”. Draft and approve conclusions and recommendations to the WORLD FAMILY SUMMIT 2016 DECLARATION to be sent to the 2017 UN ECOSOC HIGH LEVEL POLITICAL FORUM. Click here to download the Participant’s Handbook.